Should The U.S. Follow Portugal’s Example In Decriminalizing Drugs? This entry was posted in Recovery & Support, Substance Abuse and tagged Addiction, Help, Preventing Misuse, Treatment on September 14, 2016 by Team Addiction Hope. The decriminalization of drugs remains a hot topic in the United States. Currently, it is legal to smoke marijuana recreationally in Colorado, Oregon, Washington state and Washington D.C., and many advocates hope other states will follow. Some medical experts tout the benefits of cannabis oil in medical treatment, especially for serious diseases such as cancer. Furthermore, the decriminalization of drugs is a common debate topic among all demographics and social circles in the U.S. Some nations, such as Portugal, have already taken action on addressing this issue. Portugal decriminalized drugs 15 years ago, something many Americans would find shocking. You cannot deny Portugal’s positive results, however, which lends a new question to the issue: Should we be using the word “legalization”? In other words, if the U.S. decriminalized drugs, would it lower other criminal behavior? Yes, you read that correctly. 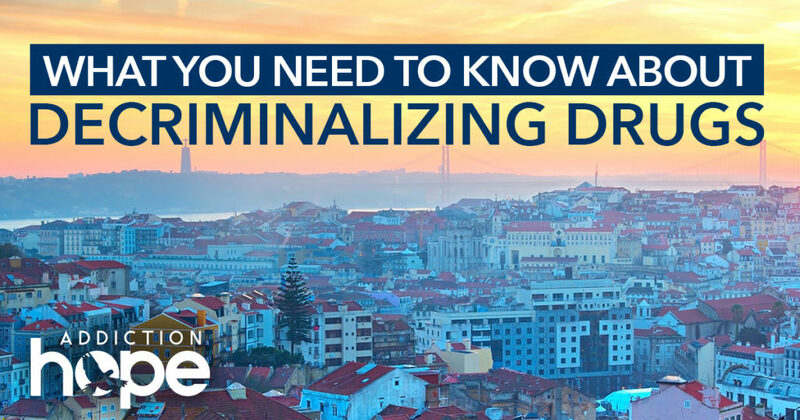 In 2001, Portugal halted its war on drugs and decriminalized them altogether. Anyone now found in possession of less than a 10-day supply of any drug – whether it’s marijuana, heroin or cocaine – will not receive jail time or hefty fines. Instead, he or she goes to a Commission for the Dissuasion of Drug Addiction. The commission consists of a physician, a social worker and a lawyer. The commission confers to recommend treatment, which often includes a minor fine. Otherwise, the person in possession of the drugs can go back to normal life. Portugal decided to decriminalize drugs after decades of drug war efforts similar to what has happened in the United States. Portugal’s drug war began in 1974, when the Carnation Revolution ended a nearly 50-year dictatorship that had isolated the country from the rest of the world. With new freedom came eagerness to experiment, not only on a political and economic scale, but also on a personal scale. Personal experimentation led to increased hard drug usage. In an effort to stop hard drug use, addiction and its consequences, Portugal’s government outlawed drugs and implemented harsh penalties and punitive correctional methods. These methods coincided with more addiction- and drug-related AIDS deaths, among other consequences. In fact, by 1999, drug-related AIDS deaths in Portugal were the highest in the European Union. Once it became clear that the status quo wasn’t working, Portugal devised a new plan to deal with drug-related fallout: decriminalizing drug use. Positive results emerged. You might expect Portugal’s drug crisis to be out of control, but the opposite is true. Initially, decriminalization did lead to increased drug use for those already using, or who had used, drugs. Eventually, drug usage declined. Between 2001 and 2012, drug use declined among adults between the ages of 15 and 64, especially among young adults 15 to 24. This is a particularly positive result, as the 15- to 24-year-old range is when most people start trying substances. Additionally, Portugal’s number of drug-related AIDS deaths has decreased since decriminalization. The country’s HIV infection rates are now some of the lowest in the European Union. According to the 2014 European Drug Report, HIV infections in Portugal continue to decline steadily. Should the U.S. Follow In Decriminalizing Drugs? Decriminalization advocates point to Portugal’s outcomes as evidence that the process works. However, no process ever plays out perfectly. Addiction still exists in Portugal and certainly would continue here too if our laws were to change. Scientists and other experts caution decriminalization advocates to remember there are myriad factors at play in the decrease of drug use and addiction. Positive results and statistics alone are not reasons to decriminalize drugs completely, many argue. Yet many experts, including Criminal Justice Professor Alex Stevens of the University of Kent, believe decriminalization in the U.S. would not be a disaster. They believe the process will not lead to worsened drug crises here and abroad. While Stevens and other experts do not say the United States should immediately imitate Portugal, they do believe there are positive lessons to learn, and that the U.S. should consider those. In the meantime, we encourage you to get help if you are struggling with drug addiction. Don’t let addiction destroy you and your life. Find a rehab center near you to help you get started on a customized treatment plan.